Hyderabad: ​​Honda Motorcycle and Scooter India Pvt. Ltd. has been closely working with Hyderabad Traffic Police since the Traffic Training Institute was inaugurated in April 2015. With 34,000+ participants trained in Hyderabad alone, Honda 2 Wheelers India has now joined hand with civil societies. The 2 day Mega Safety Drive registered participation of over 800 students at the Siva Sivani Degree College in the city. More than 2/3rd of 2Wheeler accidents have happened due to wrong riding skills by the rider while on the road. High penetration of two-wheelers in the city coupled with more and more women wanting to become independent riders, brought the need of a special safe Riding training module for the students especially females. 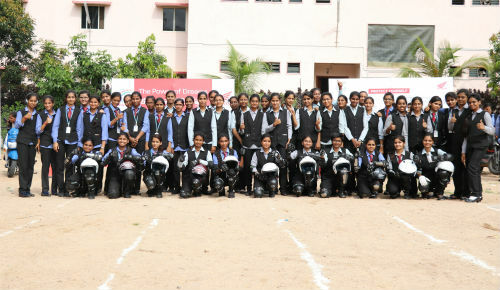 Honda’s Mega Safety Riding Drive saw its dedicated task force of skilled women safety instructors teach college going females how to ride an automatic scooter in just 4 hours. Thus empowering them to become confident and independent 2Wheeler riders on the road. The riding skill of students was enhanced further with a fun session on Honda’s proprietary 2Wheeler Riding Trainer. The device helps understand riding basics and experience 100+ possible dangers on road for both the rider as well as pedestrians. Honda’s Mega Safety Riding Initiative has been developed to cover key concern areas including road safety topics like developing road skills, concepts of speed limit, correct overtaking, basic understanding of two-wheelers, Central Motor Vehicle Act, road signs & markings and how to enhance a rider’s mental attitude. More than 300 students from the college also took a pledge on following traffic rules.